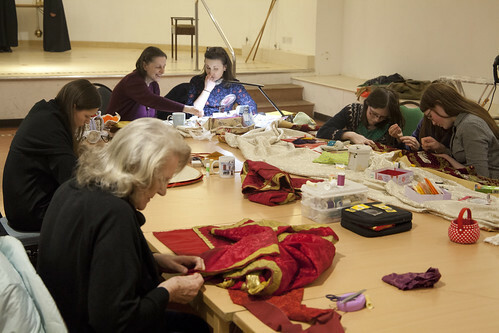 The Guild organises Vestment Mending Days on Saturdays in London, approximately every two months. Days start at 10:30am and end at 4pm. They take place at the parish hall of a central London church: we have used St Mary Moorfields in the City and Our Lady of the Assumption, Warwick Street, in Soho. The days run in parallel with Server Training days organised by the Society of St Tarcisius, the servers' sodality affiliated with the Latin Mass Society. Sewers of all levels of skill and experience are welcome, as we have tasks suited to all. 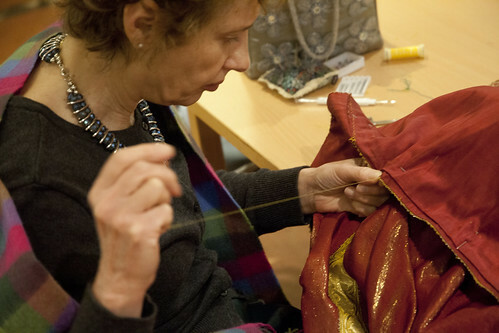 Currently we are working mostly on vestments belonging to the Latin Mass Society. 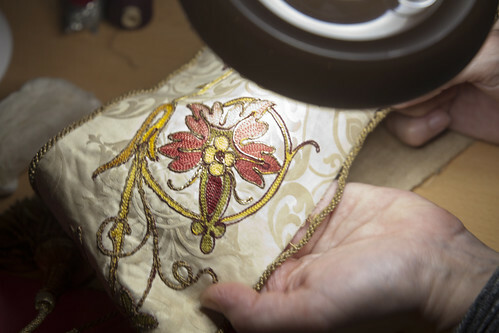 The work includes labeling and cataloging; repairs both large and small to worn or damaged fabrics; the replacement of clasps; the replacement of items missing from sets, such as maniples, stoles, and chalice veils; and the restoration of embroidery.